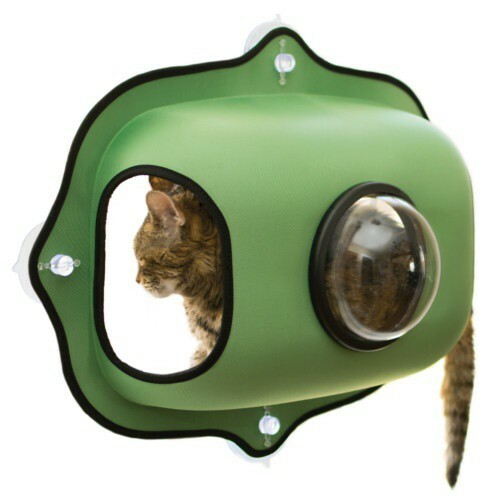 The capsule bed with suction cups for window is a fun place where your cat can spend hours observing the outside. It fits easily and in any glass through strong suction cups, creating a unique resting area for felines. In addition to bed, it is a great entertainment center, with a bubble-shaped window included to also see the interior of the house. This capsule has a super exclusive design and eye-catching that will add a touch of color to the home, as well as occupying very little space. It also incorporates a soft and comfortable pillow inside so the cat can lie down and rest. Its assembly is very simple and solid, holding up to 20 kg of weight. Cats can enjoy a unique experience watching the birds from their bed and, being a closed capsule, they can also have more privacy and security without anyone bothering them. Place the bed at the height that your pet likes best. Strong and resistant suction cups to attach to any window. Holds up to 20 kg of weight. It incorporates a soft cushion inside. It offers a high resting place and an entertainment center. It allows cats to have fun observing birds. Capsule bed with suckers for windows suitable for the rest of small and large cats. Place of entertainment and fun to watch the birds and the outside. Give your capsule bed with suction cups for window so he can enjoy resting for hours and observing the outside.